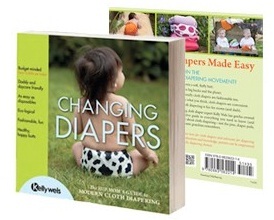 Kelly Wels Changing Diapers Book is a must have for cloth diapering moms! The inside scoop on what you can expect from Kelly Wels new book! As a former cloth diaper retailer who seriously admired the virtual cloth diaper empire that Kelly Wels had built, I was eager to read her new book Changing Diapers: The Hip Moms Guide to Modern Cloth Diapering. I was excited to learn that someone had stepped up to the bat as an adovate for cloth and had brought to the market a realistic portrayal of cloth diapers and the families who use them. I am a green mom, probably more of a medium shade of green, but I am certainly on the green spectrum and a cloth diaper lover and advocate myself. Most people picture a cloth diapering family as a mom and dad all decked out in Birkenstock sandals, growing their own gardens and driving a VW bus. Truth is, cloth diapers are just as popular with modern, hip and eco-conscious families as they are with the totally crunchy, granola making crowd. Kelly's book does a great job at really reaching out beyond the stereotypical cloth diapering audience letting new mamas and papas who are considering cloth diapers know that it IS for them too. You CAN live in a big city, wear high heels, be a haute mommy, or a daddy with a corporate job AND use modern cloth diapers. Some parts of the Changing Diapers book that I was particularly impressed by are the diagrams and explanations of the different types of diapers and how to use them. There really are a lot of choices and they can overwhelm cloth diapering newbies to the point that they become completely turned off and decide cloth is just too complicated for them. With Kelly's book, readers can see the styles as well as read about them. I also love the information about what's really in disposable diapers. Families do need to know about all the chemicals and toxins found in disposables and Kelly really did her homework. She's got everything you should know about disposables right there in one easy to read chapter. The best part, well I am a little partial because I am a mother of twins, was the chapter on cloth diapering multiples and special needs children. Kelly really gives families practical advice on how many you'll need, what styles and sizes are best and what you can expect, no guesswork required. She also points out some great tips for what to buy and how to shop, when you're going to be purchasing cloth diapers in bulk. Overall, I give Kelly's book Changing Diapers: The Hip Moms Guide to Cloth Diapering, two thumbs up! Both in quality and in content, this book is a must-have for any cloth diapering mama or papa who like to advocate cloth. You can simply lend it out as needed, or purchase a copy for friends who are expecting or considering switching to cloth. This would be the ideal baby shower gift. In fact, after reading Kelly's book I honestly think that this book should be read BEFORE you turn to the internet for your cloth diaper research or shopping. After you read it you'll know exactly where to look and what to buy, within no time Kelly will have made a cloth diaper believer out of you! Coming soon to a Knickernappies Retailer near you! In October you can expect to find Kelly's book at many of your favorite cloth diaper retailers, keep your eyes out for it!